There is certainly a lot of unmissable things to do in Cork. I spent many years in Cork and absolutely love this city. The city, often overlooked by many tourists preferring to spend their time in Galway, Dublin, Belfast or Killarney, has a lot to offer. The Cork countryside, in particular, holds many unique gems worth exploring. 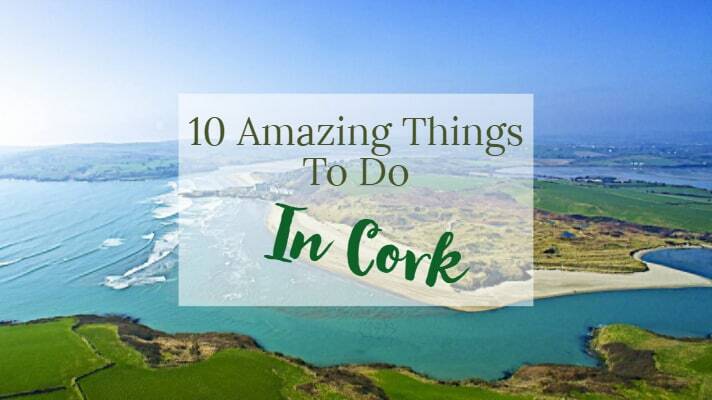 Whether you are planning a day trip to Cork or a week holiday, I guarantee these places in County Cork will make for a magnificent holiday. Inchydoney is a small island located within an hour drive from Cork connected to the mainland via two causeways. The Inchydoney beach is one of the places ‘to be’ during the summer days. Just walk along the beach, savour the windswept dunes and view the stunning landscape. Stop for a snack or overnight stay at the Inchydoney Island Lodge and admire the Atlantic Ocean. The most famous whale watching spot in Ireland is most definitely in West Cork. Species commonly seen off the south coast include Dolphins, Fin Whales, Minke Whales, Basking Sharks. Humpback whales are also often seen off the south-west coast. These large marine mammals feed in Irish waters for over seven months of the year and may be seen just a few kilometres offshore. I have to admit that County Cork has some of the best whale watching opportunities in Europe. Garnish Island, located in Glengarriff in Bantry Bay is accessible via ferry. You will have the opportunity to stop by a seal island with a seal colony on the way to the Garnish Island. The island itself has rare to Ireland’s climate plants. The walk through the gardens is absolutely gorgeous full of exotic plants found nowhere else in Ireland but here. This protected area flourishes due to the sheltered nature of the harbour and the warm gulf stream that passes by this island. This Cork pub is believed to be the oldest thatched pub in Ireland and has been in the same family since the 1600s. But it’s not back in the dark ages, and its pub grub and friendly atmosphere make this historical spot a must-visit. Kinsale, located just 30 minutes outside of Cork, is one of the idyllic little Irish towns. This famous fishing town has significance both historical and new. Historically, Kinsale was a major port, a battleground, and the site of the sinking of the Lusitania ship. Nowadays the town is a leading Irish tourist attraction and the southerly starting point of the Wild Atlantic Way trail. Located just outside of Cork City on the way to Cobh, the park is one of the best places where you can spend an entire day with a family. With all the facilities you need, the grounds are just ideal for a picnic or a beautiful, relaxing day out. Here you can meet animals from all over the world running freely (ish) on the vast open space. If you have the time why not visit the Fota House afterwards for an afternoon tea. This town located only 30 minutes outside of Cork, was the final port of call for the Titanic as she set out across the Atlantic on her voyage. Today passengers disembark directly onto the quayside alongside the Cobh Heritage Centre. The centre provides information about living conditions in Ireland during the last century, and it highlights advances from old coffin ships to latter-day luxurious transatlantic liners. Exploring Ireland’s history in Cobh is a perfect way to spend your day on a budget. Dursey Island is one of the few inhabited islands that lie off the southwest coast of Ireland. Situated at the western tip of the Beara Peninsula in the west of County Cork. This peaceful island, with only a handful of semi-permanent residents, is connected to the mainland by Ireland’s only cable car. First opened in 1969, the Dursey Island cable car is the most used means of transport across the turbulent waters of the Dursey Sound and became a top-rated tourist attraction. Located within 1.5 hours from Cork, on Bantry Bay in West County Cork, sits the Bantry House, which is the ancestral home of the Earls of Bantry. The House has a significant collection of art treasures, and you can discover them in a self-guided tour. Just outside the Bantry House, you will find the garden with its famous 100 steps. The view from the top is spectacular. Lough Hyne, located in Skibbereen (West Cork), lies approximately 90 km from Cork city and is easily accessible via car. The Lough Hyne experience starts an hour before dawn. During this time you will experience the silhouette of the seabirds on the bank, the red sunset, the stars overhead, the moonlight reflected in the water and at certain times of the year, the astonishing bio-luminescence. Read this post if you are wondering what Ireland’s climate is like and what month to visit. If you are looking for a place to stay make sure to check out Airbnb for the best accommodation options across Ireland. I also always use World Nomads when travelling around the world. Their service is excellent and they will cover you even if you are already on the move! If you are looking for more inspiration, check out some of these Irish sayings and inspiring adventure quotes. Thank you so much for all the info. I’m one generation from being a Dubliner. Have family from Dublin back as far as 1650. Each time there I feel like I’m walking on hallowed ground.